As part of the day job I’m responsible for the PR of an animal charity and have to remind the staff daily to take photos of what they’re doing and share their stories with me. As I am always telling them “if we don’t shout about it, it didn’t happen”. I realised today when I said it to a colleague that I’d done loads of great things in the last few months but had failed to follow my own advice and shout about it. 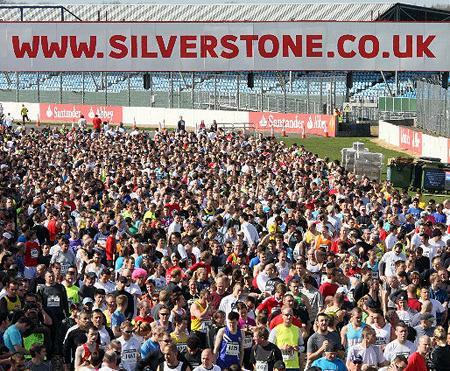 So over the next few weeks I’ll be recapping lots of great runs starting with the recent Silverstone Half Marathon. 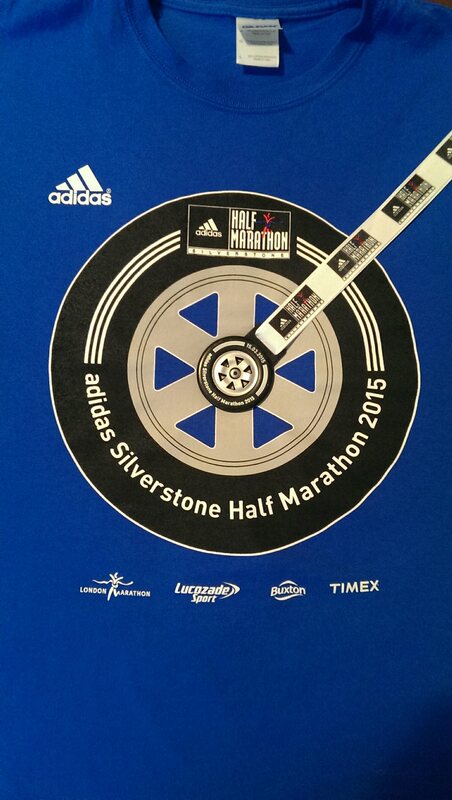 I ran Silverstone back in 2013, it was my first half marathon under 2 hours so the course holds good memories for me. 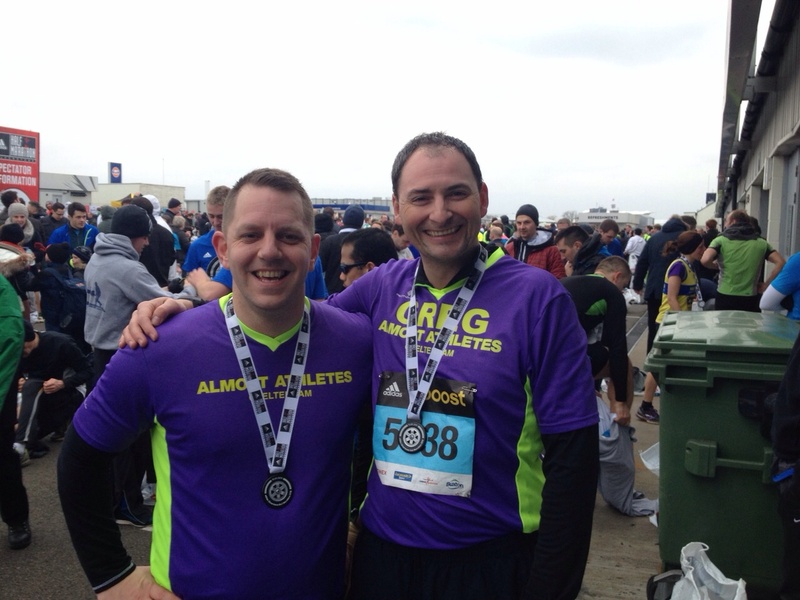 After the disappointment of the Torremolinos Half (which I’m yet to write about!) I was eager to squeeze another half marathon in to my marathon training. A running friend who used to work at Silverstone sealed the deal and so I once again found myself pacing up and down the starting grid of the home of the British Grand Prix. The glamour of a disabled toilet for changing in! It was bitterly cold so I was grateful for Greg’s old contacts who welcomed us in to the warm confines of the British Racing Driver’s Club and then the Pit Stop Cafe during the long wait prior to the race. (entry to the car parks is restricted from 10:30am but the race doesn’t go off until noon, as the route takes in some of the access roads.) 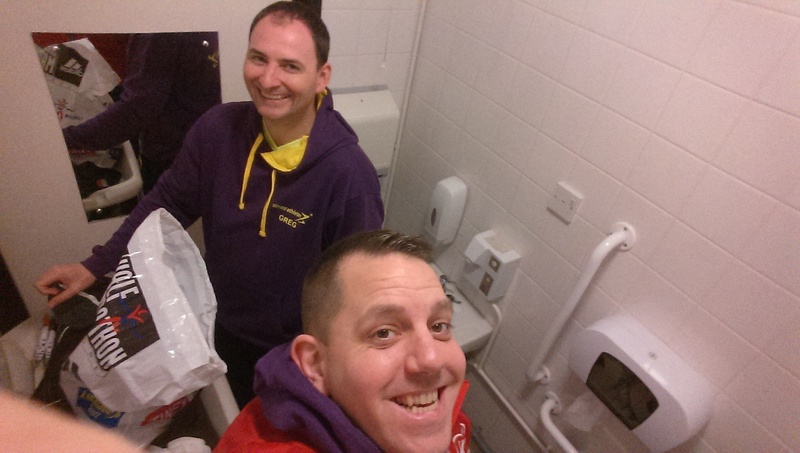 I was also grateful for the glamorous changing facilities we were able to use! After a decent warm up (yep, I take that stuff seriously now!) and cheering off the wheelchair athletes (David Weir absolutely smashed the competition, he’ll be exciting to watch in London in a few weeks) it was our turn and with celebratory shouts and the beeping of a thousand GPS watches being started we shuffled over the line. The course is wide and mostly flat, in perfect conditions I imagine it could be very fast. Unfortunately perfect conditions are rare because it is so open and exposed there’s almost always a wind to contend with! It’s also very difficult to keep the race down to 13.1 miles as the official measure is done on the apex of every corner, the traditional racing line, but with 7,000 runners in the way getting across the tarmac to take the shortest route is impossible. There’s not much to look at while you’re running, although for an F1 fan I’m sure there would be more interest. Me, I was there for one thing only and it wasn’t the views! Decent medal, but it really is time adidas shelled out for a tech t-shirt we might actually wear. Ran it with this guy, who had access to all the warm places and even a free feed after the race! That’s it for racing now, time to start the long runs and as with previous marathons I’ll be trying to get a bit creative with it. There’s no joy in pounding the same old streets for 20 miles on a Sunday morning so watch this space! This entry was posted in Events, Running, Running, Training and tagged fitness, half marathon, marathon, running, silverstone half marathon, training. Bookmark the permalink. Well done on a new PB! I ran Silverstone in 2012 and can’t say I was a huge fan of the course but I do love the medal they’ve used last year and this. Great running! Well done on a brilliant new PB too! !